We were very intentional when we named our nitinol stone extractors, right down to each device’s unique spelling. The uppercase N in each name speaks to the innovative technology that is nitinol. Each device’s name also has a double meaning as an action verb that directly speaks to its capabilities. The NCircle® Nitinol Tipless Stone Extractor, introduced 20 years ago, was the very first extractor to feature nitinol construction. It was also the first tipless basket design. Because it is truly tipless, you can position the basket flush with the mucosa to surround a stone. To strengthen our game-changing NCircle offering, we have a Delta Wire® option that provides increased radial force, and a helical design that may aid in stone capture. The multiwire design of the NCompass® Nitinol Stone Extractor produces a netting effect that helps you enclose smaller fragments and could prevent stone migration. 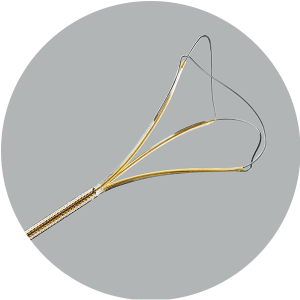 The grasper-like design of the NGage® Nitinol Stone Extractor allows you to directly target a stone and secure it for removal or reposition and release it to be fragmented. 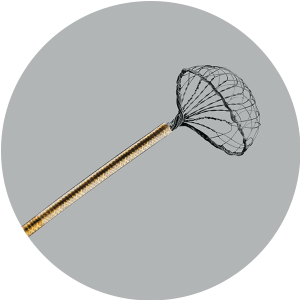 The NTrap® Stone Entrapment and Extraction Device features a bowl-like basket that is designed to catch fragments and minimize stone migration during lithotripsy. 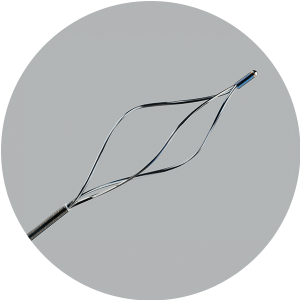 The NForce® Nitinol Helical Stone Extractor is constructed of Delta Wire to help you obtain stones with increased radial force and greater radial dilation. Taking it a step further, we offer a trio of options for percutaneous procedures that borrow from our flexible basket designs and incorporate a rigid, stainless steel cannula. At Cook, nitinol is the name of the game. Take action to extract, and choose from our 26 configurations.